Normally ice cream wouldn’t be on anyone’s mind today. Denver is a whopping 17 degrees Fahrenheit and we’re experiencing record snows. Soup? Sure! Vegan hot chocolate? Absolutely. But vegan ice cream? 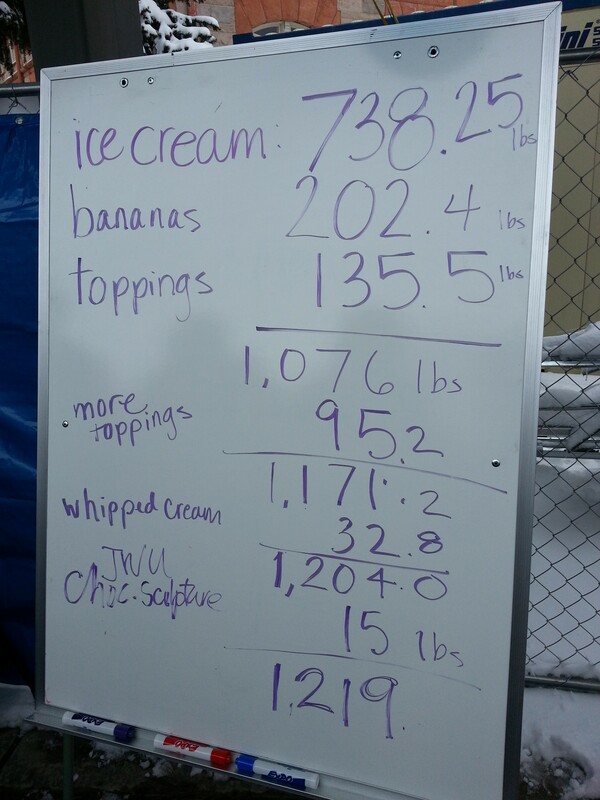 The banana split weighed in at a hefty 1,219 pounds and included flavors like Turkish Coffee, Blueberry Balsamic, Chocolate Mole and Strawberry Basil among many others. Chef Adam Sacks tells us, “We want to show the world that we can take any menu item typically laden with animal-based saturated fats and cholesterol, like the beloved banana split, and change it up, making it heart healthier and resulting in a finished product that is unbelievably tasty.” And yes, Chef Adam – it was unbelievably tasty! My portion had bananas, peanuts, chocolate and some kind of pumpkin-y ginger-y vegan ice cream. 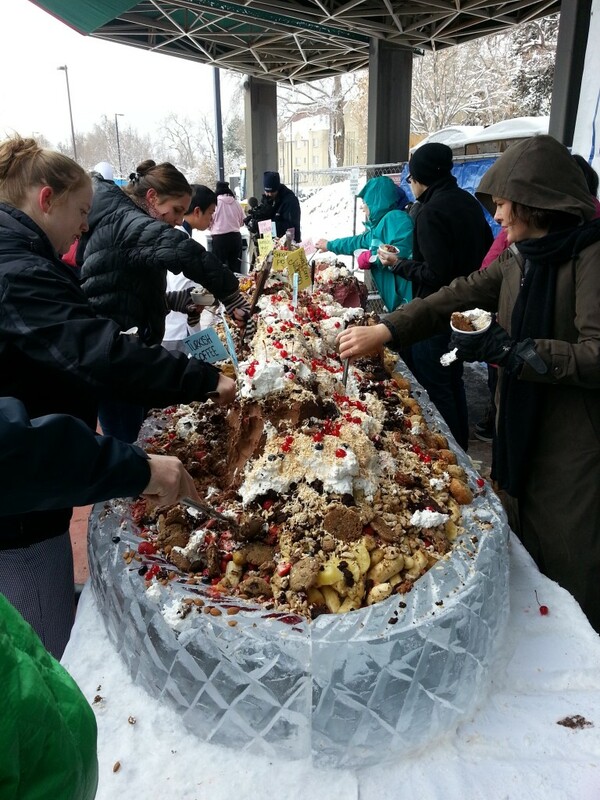 I couldn’t really feel my fingers from hanging out in the frigid winter cold waiting for my chance to eat a little of this masterpiece, but my tongue was working just fine and this stuff was terrific and totally worth the wait. 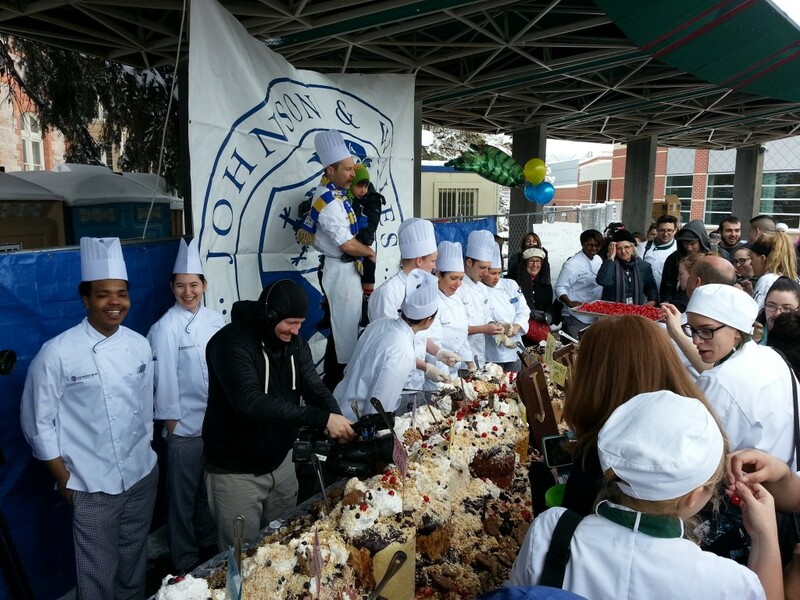 Congratulations and big thanks to Johnson & Wales University in Denver for showing the world that vegan food can be awesome! !